After a tiring day tramping up/down the Champs- Elysees or Fifth Avenue, you don’t think twice about going to a nice restaurant and expecting a good meal. Conversely, after hiking the rough volcanic trails of Mount Kilimanjaro, you enter the dining tent expecting a simple carb-loaded meal to prep you for the next day’s assault. Think again, but with different expectations. 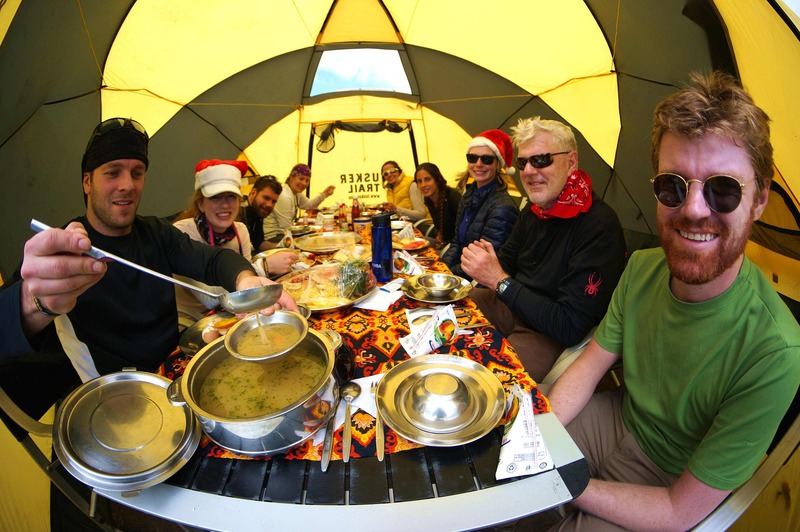 There is a multi-star dining experience on Kilimanjaro that is far from the freeze dried drek most of us associate with back-country grub. Welcome to Tusker’s Adventure Cuisine. The fruits of Tusker Trail’s five-year relationship with the Culinary Institute of America are on full display every day on Tusker’s Kilimanjaro climbs. Tusker’s chefs have been trained by the CIA’s top chefs and when you combine rich local ingredients they offer the best food on Kilimanjaro. The menus are internationally diverse, balanced, nutritious, delicious and designed to get you to the summit and back down again. For dinner on the first night on the mountain try the Chickpea and Vegetable Tagine. It’s a North African inspired dish reflecting the creative use of vegetables. Chickpeas are a wonderful source of protein and fiber consumed in large quantities in places like India where meat is either scarce or sacred. Also on the menu that night is a Moroccan spiced Tilapia and rice pilaf for the perfect blend of protein and carbs. Another night the menu is equally varied marrying potato and leek soup, a European staple, with elbow pasta with beef. The sweet ending is a bread pudding with Dulce de Leche. Other main courses on your trip could include falafel schnitzel, Spanish flavored pasta paella and crepes stuffed with bean ragout. Vegetable with white cannelloni paella is also a tasty fuel booster. A hearty breakfast gets your motor running pushing you where you need to go. On Kili mornings, the upper reaches are cold and the dining tent is where the trekkers eagerly gather. Stuffed French toast topped with warm fresh fruit might be the way to go. Pancakes, oatmeal, omelets and porridge are other typical Tusker wakeup call menu items. For lunch Tusker doesn’t pack a sack with a trailside peanut butter sandwich. Several days there will be packed lunches but they are far from basic. Buttermilk fried chicken with falafel; pita with humus salad finished with fruit and cookies is one meal. When lunch is served in the tent it’s often with a Southwestern flavor. Beef fajitas smothered with bell peppers, onions and beans is a particular favorite and tacos with carnitas are also a hearty repast. Going hungry or eating bad on a Tusker trip is not an option. Eating adventurously and right is the norm. In all things Tusker, Eddie and Amy Frank have tried to exceed expectations whether it be the highly trained guides, the gear, the hand crafted treks and especially the food. In their personal lives they love to eat well, sustainably and healthy. They have translated that to Tusker’s Adventure Cuisine. You will eat just as well if not better on the slopes of Kili as you would along the Champs or in New York City.